In this episode, variety entertainer Carisa Hendrix takes us through some of her personal steps to success which includes hiring a full-time assistant, Facebook Ads, press releases, and doing things out of order! She’s a skilled entertainer with a wide range of talents which also includes artistic director of Ballyhoo Entertainment where she crafts and designs custom entertainment options for corporate and special events. She’s a trusted authority in fire eating and teaches on the subject via her blog at Firepedia.com. Let’s just say she’s not the sort I’d like to happen across in a dark alley. Acting for Magicians by Richard Ribuffo — Pick up your copy today and SAVE $5! ManageGigs.com — a system that helps you manage all your customers, gigs, set lists, and more! ManageGigs is looking for a small group of working performers to serve as beta testers. Click here to sign up for your chance to be a part of the Beta program. I’m proud to report that we’ve recently gotten to 50,000 downloads! Thank you for all your support! As thanks, I’m giving away a free book to one lucky winner. 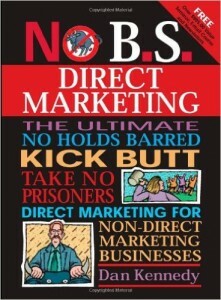 The book is Dan Kennedy’s No BS Direct Marketing book. To enter, click here and leave a comment telling me your favorite moment in one of my episodes, or one thing you’ve picked up from an interview that’s helped your business. I’ll announce the winner in a couple weeks. • Consistent, considerate, and complete work. Carisa tells about the broad topics of knowledge she has that have contributed to her entertainment business success. • Hiring a full-time assistant, and what’ she’s learned in the process. • Hiring someone that wants what she’s accomplished, so she’s also mentoring someone as well as paying them. • The value of having a personal assistant. • How she realized that she needed an assistant. • How to interview and pick your assistant. • Writing a good job description. • Bringing a non-biased third party to the interviews. • Job duties of her current assistant. • Cultivating relationships with the press. • How write press releases. • Have something to offer them. • Write it so the editor doesn’t have to do anything. • How to spin things to be more attractive to editors. • What needs to be in a press release? • Try to figure out what would make a good story. An interesting hook. Why now? What’s happening now? • Who do you send press releases to? How do you build your press list? • Using Facebook ads to reach very specific audiences. • Using ads to build their community. • Starting conversations around their brand. • When working on a goal, take a step back and see if you should be doing things in a different order. • Don’t obsess over the specific order of things. Sometimes, it may be more effective to do things out or order. • Sometimes you need to fire clients. • Entertainment is art in the pursuit of joy. • Talks about some of the “normal” jobs she’s had. • How she almost went down a different road entirely. • Having to re-learn some things. • Her parasol act that she uses as a CEO piece. • The things that get measured, get managed. If there’s something you really want to do, find out under what circumstances it would be pleasurable, and make you feel successful. Know why you’re doing what you’re doing. Where can we find Carisa Hendrix? ← Win a Book in our 50K Contest!